Description: A Semi-evergreen shrub growing to 2 feet with narrow leaves and clusters of blue double-lipped flowers. Habitat: Native to Southern Europe. It is successfully grown as a garden herb throughout the U.S. In the books of the Old Testament, hyssop was used to paint lambs blood around the doorways of the Hebrew people of Egypt in order to cause the Angle of death to pass by their homes. In the middle ages, bouquets of hyssop were hung in homes with the belief that it would deflect the plague. Today hyssop is recognized but quite underutilized as a powerful healing herb, able to assist in treating many conditions both physically and energetically. A calming and tonic herb, Hyssop has an expectorant action and can be used to treat bronchitis and respiratory infections and to help reduce fever when taken as a tincture or tea. An oil infusion made from hyssop is useful in treating bruises, cuts, eczema and can also be useful for wound healing. This powerful herb may also be used to soothe the digestive tract and aid indigestion, gas, bloating and colic as well as asthma. It has also been used successfully as an insect repellent. 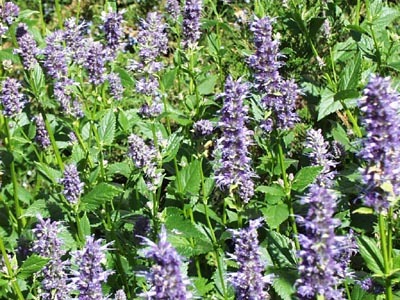 An excellent plant for purification and protection, hyssop is invaluable in its ability to dispel negativity. Hang a bouquet at the front door of your home to deflect any unwanted energy from entering. It can also be dried and displayed anywhere you wish to create extra protection, such as in a car or bedroom. On a waning or dark moon, burn it in ritual to assist in cutting energetic cords, banishing attachments or releasing patterns that no longer serve you. It is useful to combine hyssop with other cleansing herbs such as sage and cedar to smudge and clear unwanted energies throughout your home. Planted in your garden, hyssop can help create protection and a positive energetic flow throughout your yard. This in turn, can elevate the vibrational frequency around your home and garden area and act as a beacon attracting nature faeiries and elementals to your space.